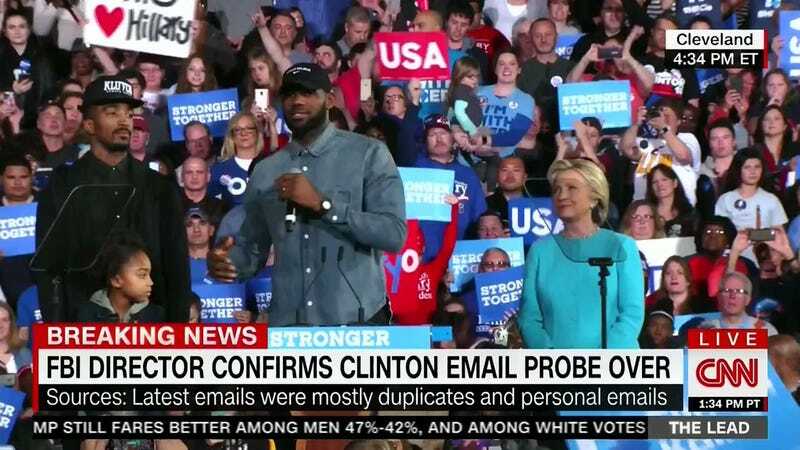 Ohio man LeBron James introduced Hillary Clinton at her rally Sunday in Cleveland. James was joined by J.R. Smith, who located a shirt for the big day, and Smith’s daughter, Demi. James’s speech echoed his October op-ed endorsing Clinton, focusing on his childhood in Akron, and the work of his foundation to make underprivileged kids feel like they have a chance, which is similar to the opportunity James says Clinton offers for our country. I want people to understand—now I grew up in the inner city, and I know the whole notion of getting out and voting. I was one of those kids, and I was around the community that was like, our vote doesn’t matter. But it really does. It really, really does. We have to get out and make sure we vote. We have to get out and be knowledgeable about what’s going on, about what we see that our future entails, and this woman right here has the brightest future for our world. With two days to go until the election, FiveThirtyEight forecasts a lead for Donald Trump in Ohio.